Not sure about summer bulbs – when to plant and what? Reap the rewards of planning and planting planters with bulbous plants ahead of the season to come. Do you, like us, breathe deeply the first aromas of spring air whilst looking wistfully back towards autumn thinking ‘If I’d planted up some bulbs when I was meant to, they’d be appearing now’. 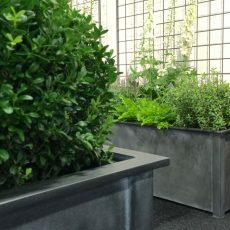 Clever placing of full and empty garden planters in tandem, with a planting up and storage area in the wings, could possibly mean that you are indeed admiring spring planters already full of promising shoots. Next on the gardening weekend list is preparation of bursts of portable summer colour in well-crafted containers. With tender shoots and late frosts in mind, it’s good to get ahead with planting up some protected bulbous summer colour in our sturdy zinc-galvanised steel garden planters. For a hit and hint of the potential splash of bold hues, we’ve prepped a Summer planters Pinterest inspiration board. The heady draw of the possibilities of daubing patios with bright colour may be uppermost in the mind but choosing a suite of characterful, stylish containers is the first step to a consistent, super stylish look in the garden. John and the workshop team at Garden Requisites have been adding to our range of handcrafted metal planters which sit so beautifully with our English wirework trellis structures, window boxes, porches and canopies. 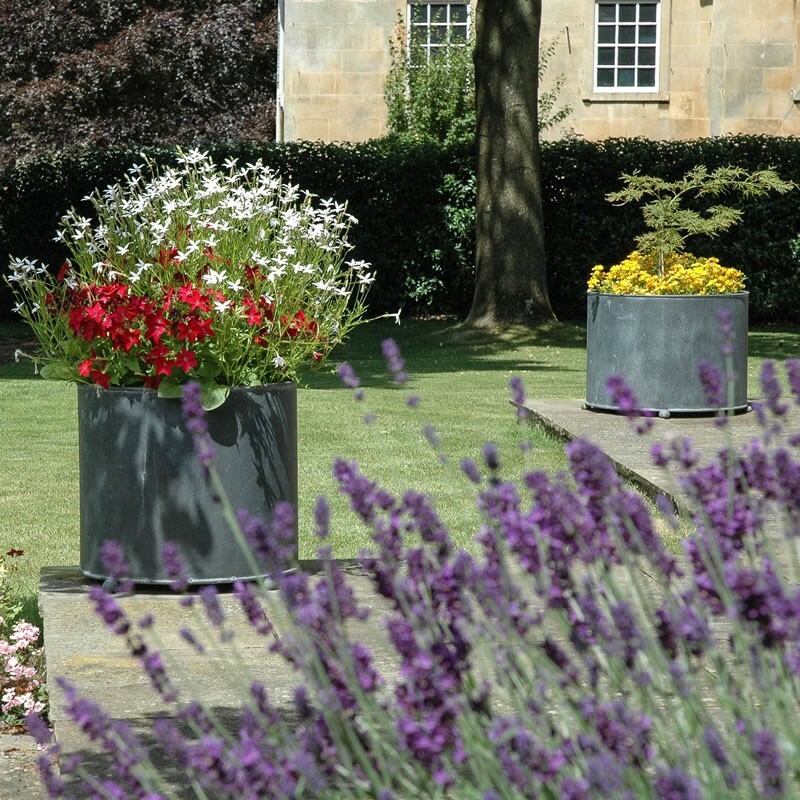 Our long-lasting frost-proof, lead-look Circular and Square Metal Planters have been joined by oblong planting Troughs, which can come with built-in trellis to very effectively divide garden areas. With thoughtful design details such as raised corner legs and easy lifting rims, these are already cherished by some of our regular garden design clients, especially our super-strong large garden planters for dwarf arboreal specimens such as olive trees. If you purely think of Daffs, Tulips and Hyacinths or lighting the home when someone says ‘bulbs’ and you’re into gardening books then you will love the depth of knowledge and beauty of this bulb bible – Anna Pavord’s book ‘Bulb’. Learn about the breadth of ‘bulbous’ plants that include true bulbs, corms, tubers and rhizomes. For more summer bulb general knowledge, this RHS advice is also helpful. Neatly packed with what will be some of the most colourful highlights of the container garden, seek out precious bulbous beauties such as Alstromeria, Amaryllis, Anemone, Begonia, Canna, Convallaria (Lily of the Valley), Crocosmia, Freesia, Nerine & Ranunculus. Kerching! Follow any frost protection notes carefully and be safe in the knowledge that these showstoppers can be quietly maturing in their metal planter or trough until the time is right to move them into position along paths, at focal points or at doorways. As always, it’s well worth knowing that we happily consider bespoke projects and sizing. Just ask. May the spring sun shine on you and your planting projects!